When car manufacturer Kia Motors America Inc. launched an ad campaign targeting video gamers they had certain definite goals. Kia Motors America is the marketing and distribution arm of Kia Motors Corp. based in Seoul, South Korea. The company’s internal research revealed that video game aficionados are 33 per cent more likely to buy a new car in three years than non- gamers, and far more likely to be acquainted with the car’s feature sets. Kia selected Microsoft’s XBox to do a hybrid (“in game” and “around game”) ad campaign, each channel feeding the other. The ads got into the XBox thanks to Massive Videogame Network, a division of Microsoft that allows advertisers to do in-game ad placements and get exposure on Xbox Live, the online multiplayer gaming and digital media delivery service created and operated by Microsoft Corp. XBox Live currently has 1.4 million subscribers worldwide. The Kia campaign was a great success from a user engagement/brand-building standpoint, according to Jeffrey Dickstein, a sales executive with Microsoft Advertising Solutions, Canada. This impact, he said, was measured by Interpret LLC, an entertainment and media market research firm headquartered in Santa Monica, Calif.
And when Interpret added the second channel, those numbers soared further: purchase consideration rose 96 per cent; brand rating, 163 per cent; brand attribute, 38 per cent; and ad recall, 76 per cent. User engagement with the Kia brand sky-rocketed, the Microsoft exec said. 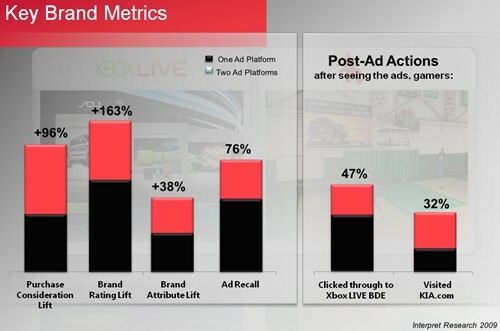 Post ad actions measured by Interpret revealed that 32 per cent of the gamers visited Kia.com, while 47 per cent clicked through to the Kia BDE (branded destination experience) on X-Box. BDE is a microsite within the X-Box console where advertisers can showcase a brand, linking it to relevant content. Dickstein, who spoke at the recent MIXX Canada Conference hosted in Toronto by IAB Canada, used the Kia example to illustrate the power video game advertising, and particularly a hybrid — “around game” and “in-game” – ad strategy. Recent advances in gaming technology, offer advertisers greater control and flexibility and it’s a key reason for the runaway success of in-game advertising, Dickstein noted. In the past, he said, advertisers had to work with publishers two years in advance to ensure their brand was in the game and fitted the context. “Previously, you had very little control,” he recalled. “For instance, if your logo changed you had huge problems because it was hard coded into the game.” Things are very different now, and today in-game ads today offer amazing levels of flexibility and control. 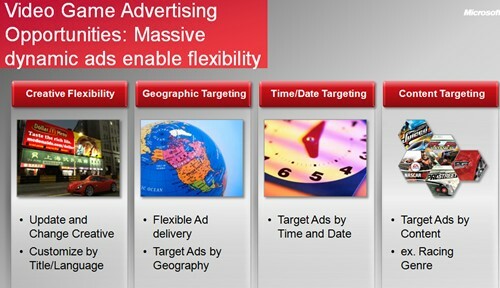 All this means advertisers can do things they never could before. In game ads today offer advertisers granular control over such parameters as ad frequency, demographic targeting, and time-and-date targeting, the Microsoft exec said. Brands can more accurately measure the impact of their X-Box in-game ads with the reporting that Microsoft provides, he said. For these dynamic ads, a complex algorithm is used to calculate ad impressions. 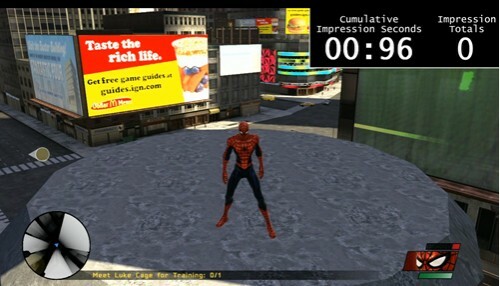 To illustrate how impressions are calculated Dickstein showed a demo video of the ad for McDonald’s Dollar Menu inserted into the Spider-Man: Web of Shadows game at various locations where Spider Man does dare devil stunts. He said the software cumulatively counts the 10 second intervals and then pings the server. In-game ads, he said, could be run in various game categories, depending on the audience the brand wants to reach. Some people are interested in reaching all gamers, so they’ll do an ad across categories, but brands could also choose specific categories – Sports, Racing, Action Adventure or Entertainment titles – to publicize their messages. Or placement can be done by the target group’s sensitivity to violence, only putting the ad in titles rated “Teen” or “Everyone.” (These video-game ratings are assigned and enforced in Canada and the U.S. by the Entertainment Software Rating Board or ESRB). How does an advertiser get their messages into the X-Box without being tied to a particular game? The answer, said Dickstein, is “around game” advertising. These “channels” he said update the gamer on what’s hot, what’s up and coming in the industry, contests, promotions et al. “We’ve reserved a couple of these spots for advertisers like you,” Dickstein told the MIXX audience. He said advertisers have a bunch of options to showcase their creative in a relevant way. 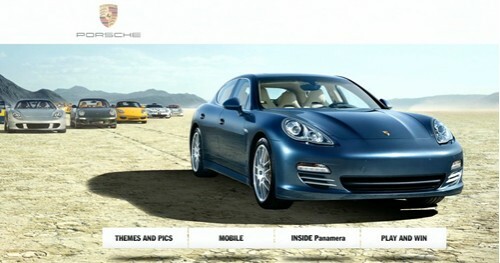 He said luxury car manufacturer Porsche used the around game advertising strategy to showcase its brand. So they used one of the spots on the X-box dashboard to advertise a “play and win” contest and offer the gamer an opportunity to download free content. Clicking on the spot took you to a BDE (microsite) where you could take part in a “Game with Fame.” It required you to “friend” American race car driver Hurley Haywood on your X-Box live. The free downloads offered included themes and pics – very popular with gamers. He said play and win contests are popular with gamers and advertisers have many options here, depending on the their brand and target audience.